Where is Ladakh and Why is Ladakhi Education Important ? The Siddhartha School is located in Ladakh, a unique area in the high mountains of Northern India. Bounded by the Karakoram and Himalayan mountains, Ladakh is the largest province in the Indian state of Jammu and Kashmir. The landscape of Ladakh, a high altitude desert, is defined by craggy, barren cliffs and plateaus. And while it’s remoteness may call to mind an isolated moonscape, for centuries the region has served as a cosmopolitan cross-roads for modern adventure travelers, ancient silk route traders, military soldiers, and religious pilgrims alike. Home to many religions from different areas of the world, including Buddhism, Hinduism, Islam, Christianity, and Bön, Ladakh was, and still is, a place of religious coexistence. Ladakh is of great strategical importance for surrounding countries, such as China, India, and Pakistan, so it was only ‘officially’ opened to tourism since in the 1970s. International travelers are drawn to adventure and ancient Buddhist monasteries, Tibetan refugees seek to rebuild their lives in exile there, and local Ladakhis are challenged with managing the development of their homeland at a break neck pace. Siddhartha School seeks to help prepare Ladakhi young people to navigate these changes and lead their communities into the future with a strong sense of cultural continuity, resilience, and innovation. 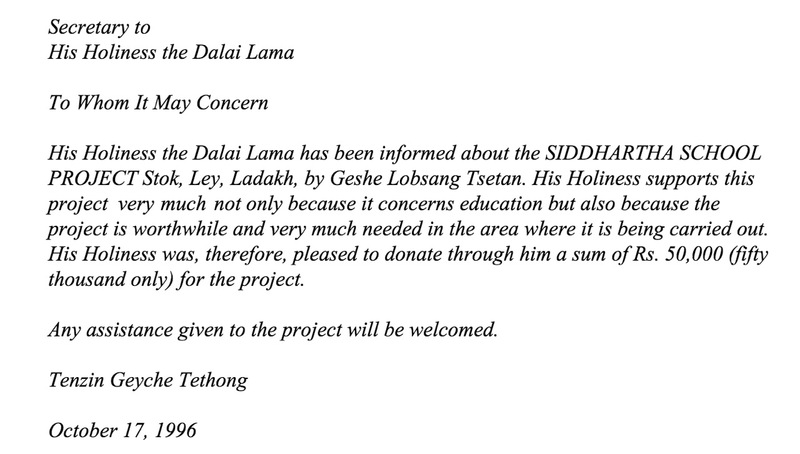 His Holiness the Dalai Lama is a donor to Siddhartha School and strongly encourages others to support the project. He enjoys vacationing and teaching in Ladakh during the summer, and has taken a special interest in promoting education for Ladakhi children.